Tactile button click and LED blink for feedback. Recessed buttons for no “pocket false alarms”. Full pivoting built-in key ring tangle-free storage. 4-6 year battery life, on A27 battery. 2.5 x 1.3 x 0.55 inches. Helix is the first professional security panel designed from the start to deliver interactive security and home automation services from the mobile device your customers have already selected. The Helix architecture knocks down costly hurdles dealers face when installing a security system. Unlike a hybrid panel, dealers don’t need to pull wires for peripheral devices or other sensors. Helix also eliminates the need to compete for entrance wall space near a power outlet, a challenge for existing self- contained security offerings. Helix can be installed in an office, entertainment center or even a closet. This reduces installation costs, while providing the benefits of locating the panel in a discrete, secure location. Every Helix system comes standard with a secured and supervised Ethernet connection enabling central station reporting and interactive controls using the homeowner’s broadband if desired. Optional Wifi, GSM and CDMA cards are available providing primary or back up communication channels for both CS reporting and interactive services. 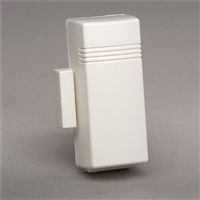 Monitors any lifting or tilting door, or equipment movement. Mount vertically in non-alarm position. 10-15 year battery life on CR123A battery. 3.3 × 1.4 × 1.1 inches. 4-6 year battery life on CR2032 battery. Can be used as any or all of the functions. Cover tamper for each Zone. 8-10 year battery life on CR123A battery. 3.3 x 1.4 x 1.1 inches. Overheat – for Furnace runaway or Air Conditioning failure. PYROFLEX™ IR sensor and HighBar™ signal processing for superior performance. 2 (two) 60 pound Pet Immunity; up to 85 pounds. 44 foot range and 90 degree field of view (45 degrees to each side). Mountable on Flat-wall, 45 degree corner, or swivel/gimbal (sold separately). 6-8 year battery life on 1-CR123 Lithium battery. 2.5 x 4.5 x 2 inches. allows these zones to be monitored by the Helix panel.